Preparing for Surgery – Cardiovascular Associates, P.C. No one wants to have surgery, and everyone enters into surgery with some degree of concern. You can be confident that if surgery is recommended, it is the decision of a combination of your doctor’s and our evaluation. Please feel free to ask any questions. There are no questions which shouldn’t be asked. Preparation for surgery begins the evening before. You will often need additional blood work performed. Blood will be cross-matched in preparation for surgery. We utilize blood from the Red Cross. The blood is screened for infectious diseases, but there is a small risk involved with any blood transfusion. Fortunately, by using devices to save blood during surgery and medications to reduce blood loss, we frequently do not need to transfuse blood, even for heart surgery. Some patients request the use of donor designated blood, blood that family or friends have donated. Although this will probably not reduce your risk of transfusion, we will be happy to assist you should you request donor-designated blood. Usually, the Red Cross requires three days to process this request. 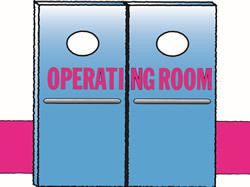 In preparation for the operating room, you will usually be shaved the evening before surgery. You will also be given a medicated soap with which to shower. You should not eat or drink anything after midnight. This includes water or coffee. You may be given some of your medications with a sip of water. If needed, there is sleeping medication ordered. 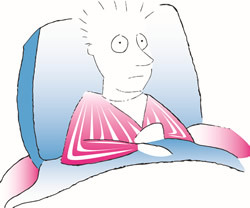 On the morning of surgery, you will usually leave your room about an hour prior to your scheduled surgery. Your family may come in early to visit you, even if you are in an intensive care unit. The family should register in the waiting room. Surgery will not usually start for one or two hours after your family has left. This time is spent in preparation by anesthesia and the nursing staff. We will send a message to the waiting room when surgery begins and at intervals during surgery. If your family has not received a recent message, it does not mean that there is any problem. If there is any problem, someone will let your family know. Sometimes operations are delayed if others have emergency needs. If your operation is delayed or postponed, it is normal to be upset. Still, knowing that the delay is that your surgeon is devoting time and attention to someone who needs it, can be reassuring. Scheduled operations will proceed as soon as possible. Once surgery is completed, your family will be allowed to visit you in the intensive care unit. They may touch you, hold your hand or kiss you. You will not be able to respond at this point in time. When you begin waking up, it may seem like you just went to sleep. You will be aware of sounds such as alarms or bubbling noises. These are normal sounds made by the equipment around you. Patients can hear and open their eyes before they can move their arms and legs. Do not let this concern you. You will have an endotracheal tube (tube in your windpipe) and may feel a slight choking sensation when you first awaken from surgery. This is because of the tube in your windpipe. Also, you will not be able to talk at this time. Rest assured that you are receiving an adequate oxygen supply. As best you can, try to relax at this point and allow the ventilator to breathe for you. You will notice that your arms are restrained. This is for your own protection. Numerous lines and tubes will be in place for administering fluids and medications, as well as lines to measure your blood pressure and vital signs. For patients who have had chest surgery, you will have tubes draining any fluid from your chest. You may notice some discomfort from these with movement. There will be a tube in your bladder to drain your urine. Frequently, patients have a sensation of needing to urinate. Relax and know that urine is being drained and you will not have an accident. The patient will frequently appear pale and puffy. This is the normal postoperative appearance. The nurses are constantly monitoring you and will take care of your needs. On the morning after surgery, most patients will have the endotracheal tube and nasogastric tube removed. You will be up sitting in the chair. You will be able to visit with your family during visiting hours. On the second day, if there is not significant drainage, the chest tubes are removed for patients who have had heart surgery. For patients who have lung surgery, typically you will go to a regular room with chest tubes in place. The other lines will be removed and most patients will go to a monitored floor on the second day after surgery. For any number of reasons, you may stay an extra day or two in the intensive care unit. This should not be cause for undue concern.